Do a little research to save you a whole lotta stress later. 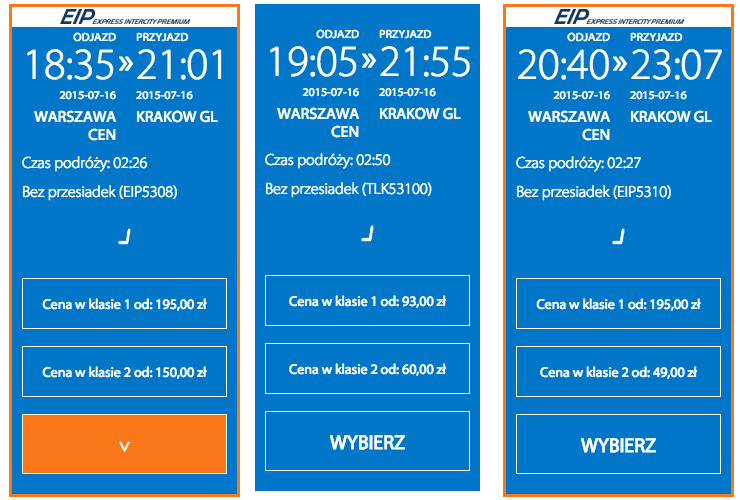 start with, "trains from Warsaw to Krakow"
and that should give you a few time tables. It runs in both Polish and English but the Polish version is easy enough to use. You can see here the length of time it takes, and the prices starting at within each class. 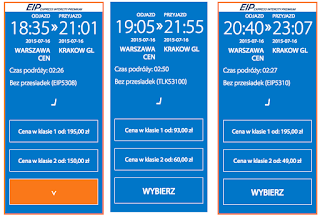 Like I mentioned before and you can see, Klasie 2 can range drastically, so if you are dead set to right cheapest, locate the time, the train number and the starting price. Go to the ticket counter (there will be a long line) or you can try using the new automated ticket machines. If you plan to go to the counter, take that written down info with you, to help stop any miscommunications. They might be out of tickets at the lowest posted price, but the next one up is still cheaper than first class. I know first class is only about 30 PLN more, but I had preferred to keep that money and get myself a nice dinner, the journey is only about 2.5 hours. You can order your ticket online and either print it or download it to a smartphone, but in my cabin I saw already two sets of people who used the app and it assigned them to the same seats. I waited inline and didn't have that issue at all. The terminal itself is easy to use, in Warsaw it's by the Złoty Terasy (a big new mall). There are about 5 info boards, all constantly updated. Additionally on each platform it announces about 10 minutes before each train which will be coming through. If they change the platform, it's easy enough to be notified. You can buy snacks on the train, but I prefer to pack my own. My return ticket, also 2nd class was 49PLN or 16USD. PS. I took the 7:05pm train and got to watch the beautiful sunset over the Polish countryside. It's so beautiful!